No one particularly wants to undergo surgery. However sometimes there is no alternative, but being well-prepared can be enormously comforting. Historically, hypnosis was used during surgery primarily to reduce pain as far back as the early 19th century. Before the advent of chemical anaesthetics, operations were a precarious business. Patients would frequently die not as a result of the surgery but because of the shock. Some enlightened doctors realised that anaesthesia could be induced under hypnosis so that pain-free surgery could be carried out. Many operations including amputations were undertaken. With the discovery of chloroform, the use of hypnosis for anaesthetic was shelved. 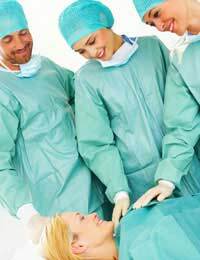 Depending on the nature of the surgery, you may experience all sorts of emotions. If it is major surgery, you may worry about your recovery, the effect on your family and how life will be for you in the future. You may feel out of control and worry about being in the hands of the medical profession. These feelings are quite natural but of course you would like to undergo surgery feeling as positive about it as possible. Preparing yourself with hypnotherapy can make all the difference to how you approach your surgery. Your unconscious mind can also be primed to allow the body to respond well to the surgery and to have faith in your treatment. Some people react poorly to chemical anaesthesia or for some other reason cannot be given anaesthetic although these cases are rare. Here, hypnoanaesthesia can be a good alternative. This entails being taught how to create numbness in the part of the body that will be operated on. This could mean that during the operation you experience sensations of pressure but no pain. These techniques can also be used for dental and other medical procedures. Just as important of course is the post-operative phase. This is when healing begins. Your body may be recovering from an incision and anaesthetic. You can use hypnotherapy to facilitate any aspect of your recovery. Staying calm and feeling positive are good attitudes to foster. You can be taught to visualise yourself healing quickly and easily, perhaps to the surprise of your doctors. You can imagine resuming your normal life. As a result, you could feel a great sense of empowerment that you participated in your recovery. During the recovery phase, you may have to have dressings changed or stitches removed. These procedures in themselves can cause anxiety and discomfort. You can use hypnotherapy to feel completely comfortable whilst these procedures are being carried out. In order to maximise your use of hypnotherapy you may want to ask your doctor what you can expect both before and after the operation. Armed with this knowledge, your hypnotherapy input can be designed to deal with the specifics. You will get the most out of using hypnotherapy for your surgical procedure if you start treatment a few weeks before your scheduled surgery. This gives you time to practise self-hypnosis and learn any techniques that might be of particular use to you. If your surgery is imminent however, you can still benefit from some last minute hypnotherapy treatment. At the best of times, preparing for surgery can be anxiety-provoking. Hypnotherapy can help you prepare yourself mentally and speed along the healing process.